Three-Minute Fiction: Exercise She closed the book, placed it on the table, and finally, decided to walk through the door. Had Ellen been a less sentimental person, she would have left the revolver as well, but it had been with her since the beginning, and she found it a comfort. Our contest has a simple premise: You send in stories that can be read in three minutes or less. For Round 8 of our contest, we asked you to send us original works of fiction that begin with this sentence: "She closed the book, placed it on the table, and finally, decided to walk through the door." Our winner was "Rainy Wedding." She closed the book, placed it on the table, and finally, decided to walk through the door. Had Ellen been a less sentimental person, she would have left the revolver as well, but it had been with her since the beginning, and she found it a comfort. Outside the air was fresh, and the mailman touched his hat to her. She began walking in the direction of the dock. Twice she allowed herself to look back at the green facade of the old house, its size diminishing by one half between the two glimpses. After that, she kept her eyes straight ahead and felt a chill when she reached the point at which she imagined the house pinched out of the landscape by perspective, but she dared not look back. Now that part is over, she thought. She took the ferry over to the island. In a snack bar no bigger than a bathroom stall, she bought two cellophane-wrapped tuna sandwiches on white bread, and used them to cushion the revolver in her bag. The man at the opposite dock who opened the gate to allow the ferry passengers entry smiled in a familiar way, though she did not know him. Certain pale roses lining the path to the rocky beach also had a familiar look, as did the worn, gray boardwalk, and the color and tilt of three beach umbrellas, a red one sloping west and the other two, a green stripe and a solid blue, to the east. She walked between the red and the green stripe down to the shore, stepping over a curving line of seaweed stranded by the tide. A small silver button shone within the cage of its tendrils. 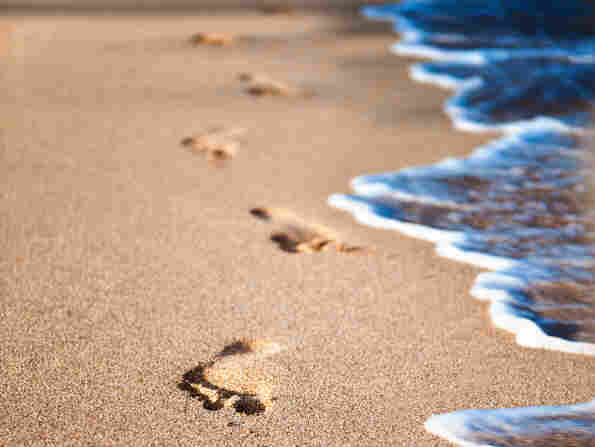 For almost an hour she walked east along the shore, the backsliding waves filling her footprints with foam, and sometimes minute, opalescent shells. She looked back three times; the three umbrellas diminished from colored shapes, to dots, and finally to points of indeterminate color and orientation. She knew she was approaching the next part. Directly in front of her, a long-legged bird (perhaps a plover?) traveled crookedly along the waterline. It darted behind her as it chased its quarry. Turning her head to follow it, the diminished umbrellas clipped her peripheral vision. She jerked her head forward immediately, but it was too late. She closed her eyes in exasperation. Why must there be all these rules, and why was she forbidden to take the book? She did not know, but she did know that she could not proceed. She would have to go back and read the book. Again. But first, she would eat one of the tuna sandwiches, which by now would have taken on the pleasing imprint of the revolver.